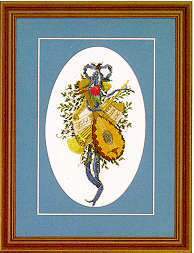 This intricate instrumental design by Rebecca Waldrop of Serendipity Designs is stitched on 18ct Ivory Aida. The stitch count is 88 x 166, for a finished size of about 5" x 9". What's included in our cross stitch kits? Add these to your order using the drop-down box above!